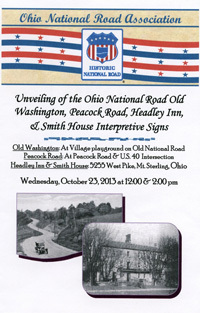 The Old Washington (shown here waiting unveiling) and Peacock Road Ohio National Road Interpretive signs were unveiled on October 23, 2013. This sign is located near the Village Playground. The ceremony began in Old Washington and, because of the poor conditions outside, the ceremony was moved inside to the basement of the Old Washington United Methodist Church. 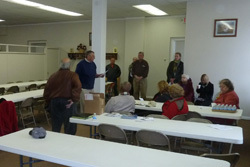 While attendees enjoyed refreshments including coffee, cider, and locally famous Kennedy’s Bakery doughnuts, ONRA Guernsey County Board member and Old Washington Village Councilman Ed Wagstaff (shown standing in center) spoke about the town’s history and its situation on the National Road. Speakers at the ceremony included Guernsey County VCB Director Debbie Robinson (shown standing) and Village of Old Washington Mayor Diane Barnes (via letter). 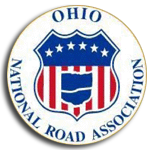 ONRA president Doug Smith (not shown because he took the pictures) spoke about the history of the National Road and the Association’s signage project. Additional Old Washington and subsequent Peacock Road sign unveiling ceremony participants included Center Township Trustees Bob Oakley and Doug Dodd, and Guernsey County Commissioners Tom Laughman, Dave Saft, and Skip Gardner (shown standing). Also present (back right) was Mike Neilson from The Daily Jeffersonian. 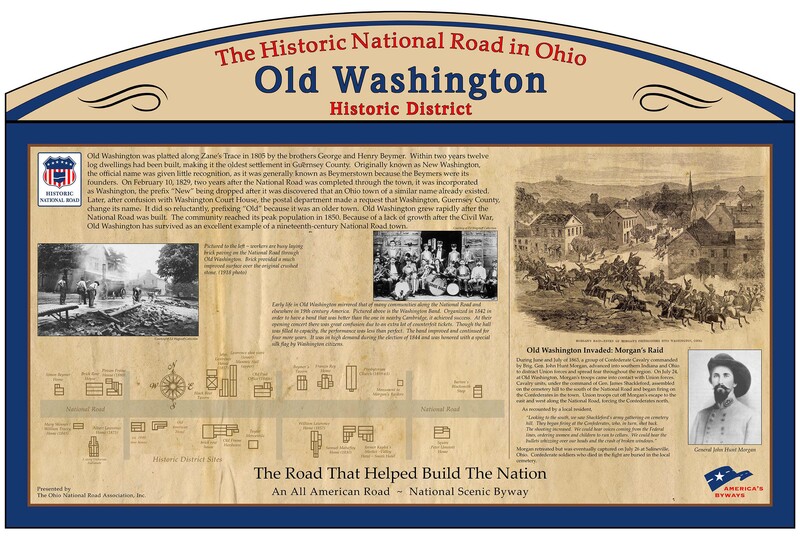 The Village of Old Washington in eastern Guernsey County is commemorated on this Ohio National Road interpretive sign. 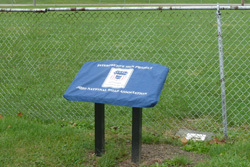 It is installed in front of the playground fence on the historic National Road (not U.S. 40) about 50 feet west of the Morgan’s Raid historical marker and National Road mile marker 172. 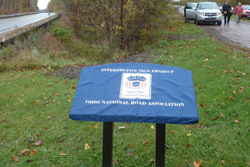 The Peacock Road interpretive sign stands in the rain as unveiling ceremony attendees arrive. This sign is at the western intersection of Peacock Road and US 40. 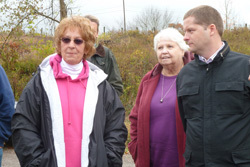 Local resident and Peacock Road historian, Libby Wiggington (shown at left), spoke about how dedicated her family is to the National Road as was her mother. She introduced Pete Gooding (shown at right) who is one of her two sons who is ready and willing to keep her mother’s legacy going. 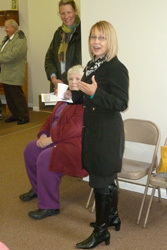 Also shown (center) is Linda Wagstaff, wife of ONRA Board member Ed Wagstaff. 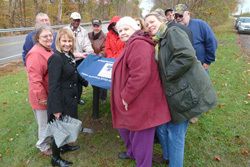 The Peacock Road sign was unveiled by (L of sign wrapping around behind to R): Guernsey County VCB Director Debbie Robinson (black jacket), Judy Clay (curator of the Guernsey County History Museum), ONRA Board members Ed Wagstaff, John Maddox, Mike Peppe, Cathy Nelson, and Mary Ellen Weingartner, Justin Shepherd (Old Washington Village Councilman), Rick Casterline (Wills Township Trustee), Pete Gooding, Tom Chambers (Center Township Trustee), Rebecca Wagstaff, and Linda Wagstaff (Ed’s daughter and wife). 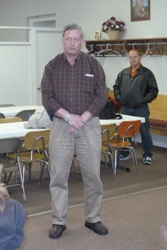 Also present was ONRA President Doug Smith who took the photos. 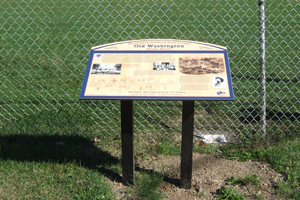 This Ohio National Road Interpretive sign commemorating Peacock Road was installed about four miles west of Old Washington on U.S. 40 in Guernsey County at Center Township Road 650. It can be found at the west entrance (from Rt. 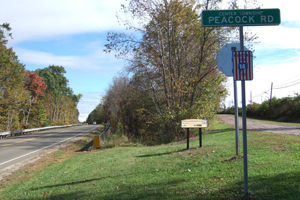 40) to this old Road segment also known as Peacock Road, across from National Road mile marker 175. As is explained on the sign, this part of the Road was paved with bricks in 1918, and you can still drive on those bricks today! 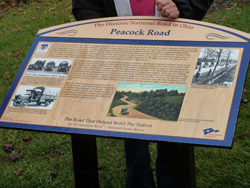 Close-up of the beautiful Peacock Road Ohio National Road Interpretive sign.